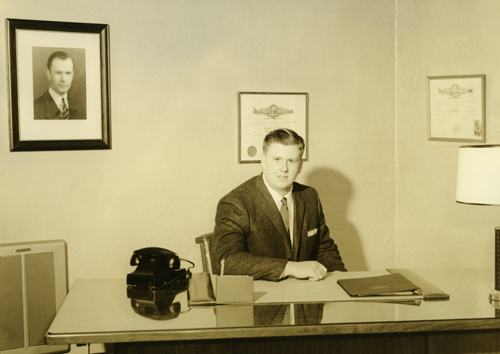 The Burgman family business began in 1935 when Uncle John Kalin opened a Funeral Home on Broadway in Seattle’s First Hill neighborhood. 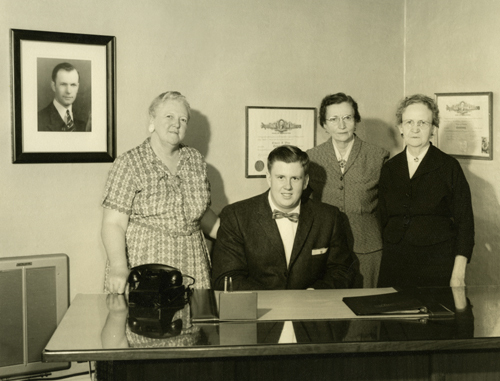 His wife, Lucy, a registered nurse, received her embalmer’s license in 1937-a true woman pioneer in the field. After 15 years of successfully caring for Seattle’s families, Uncle John passed away in 1950. At that time Lucy Kalin and three of her sisters, all professional women ahead of their time, managed the funeral home. The youngest sister, Madge Burgman, a registered nurse and natural business woman, worked alongside her sisters and her son, Tim, who began working there as a teenager. Madge Burgman, Tim Burgman, Lucy Kalin and Agnes Lilligreen. Tim Burgman working in the Seattle office where his career began. 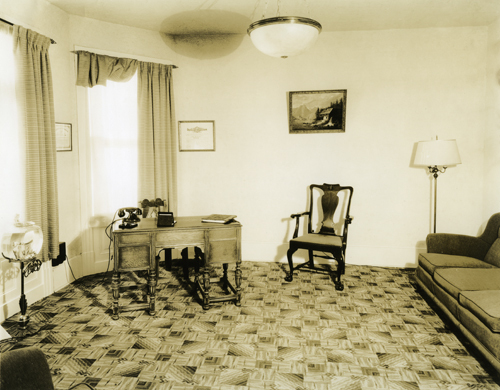 Pictured is the original desk used in 1935. 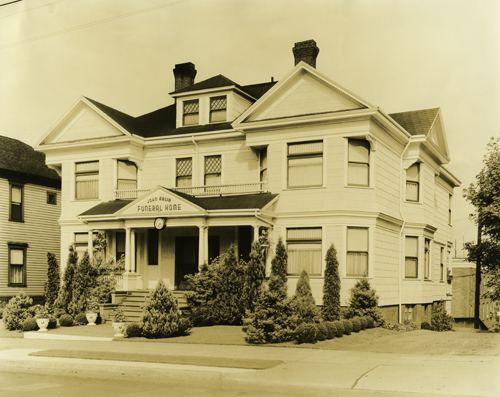 It is still used in the grand lobby at Woodlawn Funeral Home.In 1964 the business was sold to Seattle University. Tim Burgman, along with his mother, Madge, Aunt Lucy and young family, moved to Lacey, WA in 1965, where they opened a new funeral home located on Pacific Avenue. 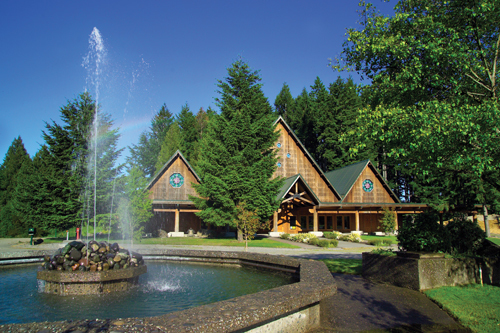 The spacious 24,000 square-foot funeral home is designed in a Northwest open-beam style. 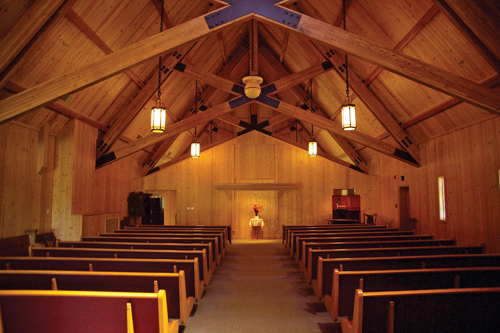 The funeral home features large and small chapels, viewing rooms and original stained glass. Two rose windows, inspired by the cathedrals of Europe, are placed prominently in each chapel. Click here to go to Our Facilities page. The wood logs and lumber were cut from timber on the Burgman family property. Tim Burgman’s eldest son, George, was the principal logger. All specialty notch cutting was completed onsite. Local workers and trades people were employed throughout the building process. The Burgman family prefers to purchase goods and services locally when possible. This unique water feature includes a rock that was chosen from the Burgman family property in the Bald Hills. The rock weighs approximately 22,000 pounds and stands 9 feet high. 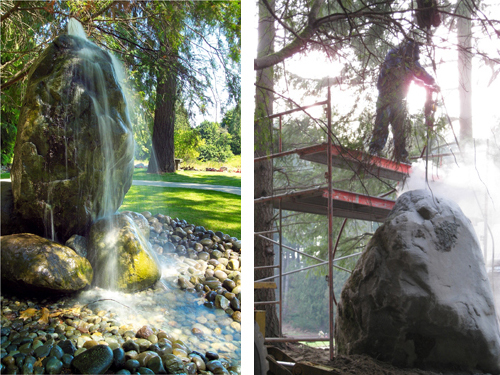 It took the cemetery crew 2 days to drill through the rock and create the cascading water effect. 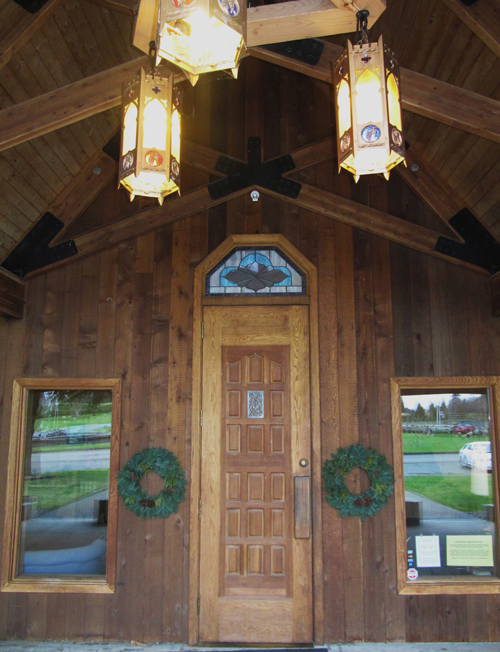 Chandeliers in the lobby and portico were custom-built onsite from old lighting fixtures re-used from a chapel at Ft. Lewis. 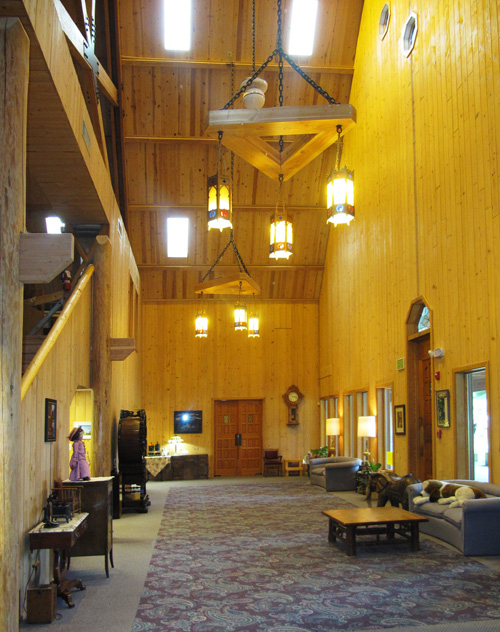 apex and is a welcoming gathering place for families. The front entrance door (12’ 8”) was a special request from a very tall friend (6’ 8”) of the current owner, Tim Burgman. His friend asked him to make a doorway for his height. So, any giant would feel comfortable walking through the entrance. 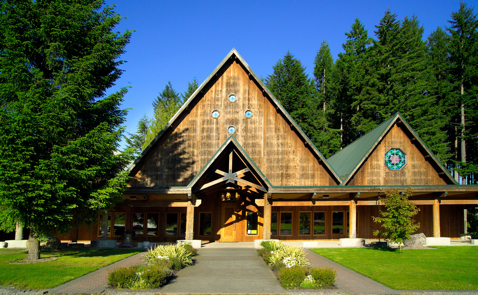 Our large chapel, with a capacity of 200, can accommodate most services. It has a state of the art sound system and video/PowerPoint presentation capability. 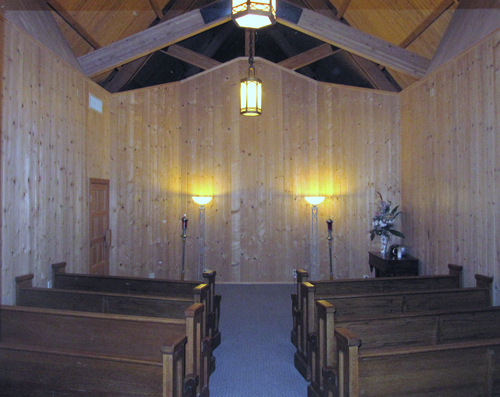 As with the chandeliers in the lobby, the lighting in our chapel was repurposed from an old chapel at Fort Lewis. The stained glass along the exterior wall was custom crafted by a local artisan who lived down the road from Woodlawn Cemetery. Tim and Ann Burgman’s children are involved in the family business. George Burgman, the eldest son, helps on special construction projects. Kathleen (Blanchette) Burgman assists with special projects. Teresa (Goen) Burgman has been a licensed funeral director since 1995. Woodlawn has truly become a multigenerational business. Attention to detail, commitment to family and community are the heritage the Burgman family has passed on from generation to generation.